It’s a pleasure to respond to Lambert Zuidervaart’s latest example of rigorous, fertile, reformationally-inflected philosophy. While all his work bears the impact of that tradition, this book gathers his reflections on core reformational commitments in a single volume, places them front and centre and subjects them to instructive critical exploration and development. It is a major contribution to reformational philosophy and will usefully stir up fresh debate about what a “critical retrieval” of the tradition might amount to. In chapter 12, Zuidervaart uses a dense passage from Hegel’s Philosophy of Right as a springboard for wider reflections on the contemporary relationship between religion and the public realm. In 15 pages he succeeds in framing lucidly much of the disputed territory in current (western) debates on this relationship. 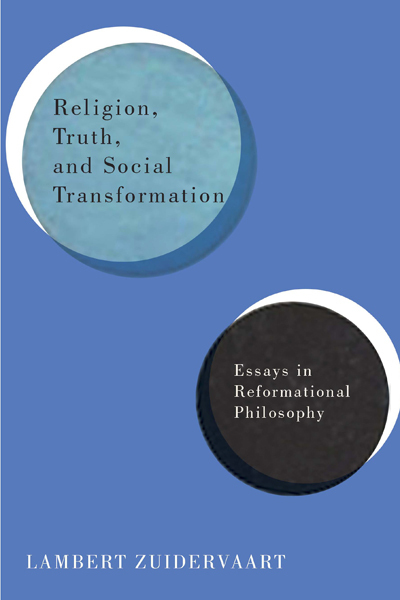 I agree with many of the claims in the chapter: his critique of Hegel’s conception of the “subjective” character of religious truth claims (as mere forms of “subjective rationality,” as opposed to the “objective rationality” actualized in the state); his insistence on the vital distinction between “spirituality” as all-encompassing orientation and “religion” as institutionalized worship and faith; his affirmation of the critical public role religious communities should assume in the face of societal injustice. Here I’ll focus on his remarks on religion’s relationship to the “state” and the “public sphere” (in the hope of returning to “civil society” in my response to chapter 13). Zuidervaart’s definition of religious truth is highly compressed, assuming detailed work done elsewhere. By being somewhat elusive it may invite misunderstanding. Religious truth, he proposes, is “a process of worshipful disclosure in dynamic correlation with human fidelity to the societal principle of faith as hopeful trust” (239) – hardly a standard definition. The reader would need to understand how key words in that sentence – “disclosure,” “correlation,” “fidelity,” “societal principle,” and “trust” – function as load-bearing terms of art in his larger conception of truth. I won’t say much on that larger conception here since other contributors to this blog have been tasked to do so. I’ll comment on the notion of a “societal principle” in my response to chapter 13. But let me try to pre-empt one possible concern which might legitimately arise were we to approach the question of religious truth from a primarily theological or confessional standpoint. Zuidervaart’s goal in this chapter is not to give an account of the epistemological status or substantive content of Christian religious truth claims (aspects of such an account appear elsewhere in the book). Still less is it to argue, in apologetic mode, for their truth. Rather it is to offer a philosophical account of the universal human phenomenon of religion. This is not a uniquely reformational project (it goes back to Augustine) but it is a quintessentially reformational one (and reformational thought is deeply indebted to Augustine on the point). Reformational philosophers have typically framed the project in terms of an “ontology of religion,” resolving ultimately on the “created structure” of religion – its foundational, orienting role in the very constitution of what it means to be human. Zuidervaart does not discuss such a framing in this chapter although he does in others (e.g. 1, 3, 6, 10). In fact in chapter 3 he criticizes Dooyeweerd’s particular account as falling into the error of a “structuralizing” of religion, i.e. construing it as a fixed ontological “structure” rather than a matter of spiritual “direction” (64ff). Yet he still endorses the admirable reformational aspiration to give a philosophical account of religion as a universal phenomenon of human creatureliness. In any event, given that his focus is on religious truth as a human and historical phenomenon, with all the necessary hermeneutical provisionality thereby entailed, we can readily see why he would reject Hegel’s claim that religious truth is “absolute” (239). This also helps explain what to some observers may appear to be a “subjectivist” definition of “revelation”: “If ‘God’ speaks in [a religious community’s] stories of faith and in their retelling…and shows up in the rituals of worship and their re-enactment, then such stories and rituals are media of ‘God’s’ being revealed” (240) – he might have added, “for such a community.” And in the same vein: “Doctrines are attempts to render explicit the significant meaning of a community’s stories of faith and rituals of worship” (241). [G]iven that [Zuidervaart's] focus is on religious truth as a human and historical phenomenon, with all the necessary hermeneutical provisionality thereby entailed, we can readily see why he would reject Hegel’s claim that religious truth is “absolute” (239). As I read it, nothing in this generic philosophical account of human religious truth prevents Christian (or other) believers from confessing without reservation, and proclaiming confidently in (suitable) public settings, that the revelations or doctrines acknowledged by their community are “true” in an authentically biblical sense of that term (which, as Zuidervaart also rightly notes, is in any case never merely “propositional”) (241). Indeed a key virtue of the account is that it reminds us that when we engage in such confessional or proclamatory speech we do so alongside, and should do so in conscious solidarity with, other human beings who are inescapably engaged in the same search for truth whether they know it or not and however they name it. Hegel’s own argument for why the state needs such a dialectical relationship with religion is that it is “the most comprehensive source of societal integration.” Zuidervaart rightly rejects this imperious conception, insisting that the mode of integration secured by the modern democratic constitutional state is not (or should not be) comprehensive, but (modally) delimited. It is a legal and political integration – a special type of bond (one could call it a thick sense of “citizenship”) generated when the state effectively pursues its characteristic normative task of promoting “public justice.” This brings about a functionally specific form of integration around the task of arranging, via the limited instruments of law and administration, just interrelationships among the diverse individuals, communities and institutions in a society (241-2). Zuidervaart’s formulation here puts Dooyewered’s own insightful, if rather abstract and bloodless, account of the unique mandate of the state for public justice to evocative critical use. Let me add a few remarks on each pole of the dialectic of state and religion. Yet going beyond this “critique” of the current operation of state power, religion should also exercise a “utopian” or “prophetic” role, invoking an eschatological horizon that depicts a future in which all creatures enjoy “interconnected flourishing” and that “relativizes the state’s accomplishments and mandates” (243). Overall I find this account of religion’s public critical role thoroughly congenial. Let me explore three questions. First, how exactly is the specifically “utopian” dimension to religion’s political role to be concretely expressed in the public sphere (as distinct to within the community of faith)? What does it consist in beyond simply the mounting of normative “critique”? Won’t an eschatologically inspired and suitably formulated public critique of state pretensions or failures just amount to an effective “critique” of its current operation? In the public sphere, what more would a “prophetic” critique offer? A Barmen Declaration? A Kairos Document? I’m genuinely curious. In the public sphere, what more would a “prophetic” critique offer? A Barmen Declaration? A Kairos Document? I’m genuinely curious. Second, some might ask whether the attribution of a critical and prophetic role to religion doesn’t stand in tension with Zuidervaart’s repudiation of religious claims as “absolute.” It could be countered that prophecy, or even critique, cannot be mounted by those who lack the depth of commitment attaching to unshakeable convictions. In any event, I wonder if he would accept the following reading of his point. Hegel can afford (so to speak) to concede the “absoluteness” of religious claims only because he disallows that they might be turned into a public ethical critique of the state (however important they might be otherwise). By contrast, Zuidervaart can accord substantial societal space and normative political import to such claims just because he denies their “absoluteness” (in the sense of dogmatic certainty). It is precisely because public religious claims must be recognised by all as being voiced by human actors that those advocating them can, without fear of a lapse into hegemonic ambition, be accorded the full freedom to call the state to account according to what they take to be norms and visions that come from beyond the merely human. This, at least, is how I read the following sentence: “[T]he supposedly ‘absolute’ character of religions does not lie in their offering a source of dogmatic certainty, but rather in their placing in question contemporary attempts or failures to pursue solidarity and justice” (243). If I have read Zuidervaart rightly, I find myself in essential agreement. Third, let me float a possible historical rider to Zuidervaart’s account. Historically, those religions that have deployed the normative critical potentials of religious truth most powerfully are those holding to strong conceptions of “revelation” (indeed in some cases to religious claims as “absolute”). Such potency has, moreover, been displayed (both for good and ill) not only, as Zuidervaart seems to imply (243), in modern religions that have enjoyed the “critical freedom” consequent upon their “decoupling” from the state via processes of institutional differentiation, but also in pre-modern ones, especially Christianity. This is so, arguably, even under medieval Christendom where, notwithstanding the church’s dreadful lapses into collusion with repression, at certain key junctures the consistent distinction between “spiritual” and “temporal” jurisdictions did serve to delimit the illicit pretensions of political power (albeit within the constraints of a unified corpus Christianum). This was seen, dramatically, in the two centuries-long contest over the libertas ecclesiae – the “freedom of the Church” to appoint its own bishops and not have state lackeys imposed on them. It was seen, incrementally, in the cumulative achievements of canonist and civilian lawyers whose work contributed to the foundations of what was to evolve into modern democratic institutions, including the idea of human rights (as Nicholas Wolterstoff reminds us in Justice: Rights and Wrongs). Such a critical potency manifested itself with even greater vigour during and after the Reformation, which, as legal historian John Witte has shown, made its own unique contributions to the evolution of modern constitutionalism, even to the extent of formulating charters of rights and instituting popular election. The most robust of these emerged from the Calvinist political movements to which Kuyper looked back (albeit hagiographically) as his inspirations. I am curious as to whether Zuidervaart would be willing to incorporate such considerations into his reading of the history of the religion-state relationship, since it would involve a slackening of the rather tight pre-modern/modern periodization that he (and Dooyeweerd, as it happens) seems to operate with. So much for what religion can offer to the state. How about what the state can offer to religion – the second pole of the dialectic? Zuidervaart’s formulation – “the state must ward off any attempt to put religion in control of the state and must protect citizens from religious imperialism” – recalls Alfred Stepan’s instructive account of the “twin tolerations” secured by the modern constitutional state: the state tolerates all (law-abiding) religions, according none of them any constitutional privilege, and religions tolerate each other, refraining from invoking state power to do down their rivals. Thus Zuidervaart proposes, first, that the state protects religion against illicit encroachments from other institutions, by securing political and legal space within which it can be itself – within which “faith and worship…[can] have their own legitimacy and worth and not succumb to the dictates” of states, markets or any other entities (244). But, second, the state also holds religion to account by “countering religion’s own worst tendencies with respect to public justice,” such as the aspiration to dominate the political framework, to coerce other citizens religiously, or to “collapse social critique into ideological assertion and to turn eschatological vision into political imposition” (244). This is all well-stated, not least in view of the upsurge of radical Islamist political movements which are exhibiting all three pathologies to an extreme degree with deadly consequences across the world. But over the last 30 years it has become increasingly clear that these two state purposes – securing religious freedom and curbing religiously-legitimated injustices – increasingly seem to find themselves in conflict even in stable liberal democracies. This is both because of the increasing claims of state power over more and more areas of personal, social and economic life where religious institutions used to enjoy extensive autonomy (such as freedom of conscience, control of curriculum, hiring policies, etc.) and because of the expansion and intensification of the demands of “public religions” which are pushing back the liberal state’s own definition of the public/private distinction. While it was beyond the scope of the chapter to address this question in detail, it’s worth noting that the task of determining what Locke famously termed the “just bounds” between religion and state is becoming formidably complex. In adjudicating conflicting demands from religious and nonreligious institutions [he might have added, “and individuals”], and in weighing the claims of diverse cultural communities, some of which have religious roots, the state must adhere to a nonreligious and publicly accessible conception of public justice. Otherwise injustice toward nonreligious institutions and communities will inhere in the integrating framework of public justice (244). Zuidervaart’s specific remarks on this theme presuppose a broader conception of “democratic communication,” a normative practice imposing a duty on citizens and officials to show “universal respect and egalitarian reciprocity” when engaging in discourse on public justice in the public sphere (249). That noted, let me pick up from the quotation above. First, I agree that the conception of public justice invoked by the state must be “nonreligious,” in the sense that it must not explicitly invoke any religious conviction as its overt justification. Let me offer two proposals on this. One is that this is a restriction applying only to the state per se, not to either citizens or their organizations. Thus, for example, it is legitimate for a Christian Democratic party to campaign on a religiously-grounded manifesto, invoke those groundings in parliamentary debates (Habermas wouldn’t allow that – would Zuidervaart?) and then, if in government, implement its manifesto commitments – but with the crucial proviso that, when speaking as state officials, Christian Democrats don’t invoke their religious convictions as official justifications of state acts. The other is that, presumably, the same proscription applies to conceptions that are “secularist” (e.g. “the state must maximise the potential for autonomous self-realisation of each citizen”), in the sense that they might depend for their substance on a secular worldview whose official invocation would do equal injustice to religious communities. Would Zuidervaart grant that point? He goes on, however, to add that the official conception of public justice must also be “publicly accessible,” but he doesn’t define that much-contested term. There are, however, different definitions of “accessibility” (actual acceptance, actual acceptability, in-principle acceptability, intelligibility, etc. ); different proposals as to the nature and scope of the audience to whom a public conception must be accessible (all citizens; most; all informed citizens; all rational citizens; citizens behind a ‘veil of ignorance’; etc); and so forth. To invoke “universal respect and egalitarian reciprocity” doesn’t resolve the question since these terms also admit of several competing definitions. Second, consider Zuidervaart’s discussion of whether a religious conception is inherently publicly inaccessible – whether religiously-grounded public discourse doesn’t “lift matters of general concern out of the public arena and into a place where democratic communication is either impossible or inappropriate” (249). I find this proposal plausible and appealing. But to probe it a bit, and to conclude, let me invite Zuidervaart’s thought on this suggestion: that the “invitational” character of religious truth claims could allow that, for example, Paul’s proclamation to the Areopagus (“what you worship as unknown, this I proclaim to you” [Acts 17: 23]), would also meet the criteria of “democratic communication.” I think Paul would wholly agree that what he proclaimed at the heart of Athenian public sphere didn’t amount to anything like the religious “knock-down arguments” that Zuidervaart rightly criticizes (251). On the contrary, as Luke’s account has it, Paul “was greatly distressed to see that the city was full of idols” and “so he reasoned…in the marketplace” (Acts 17: 16-17). Rigorous reasoning motivated by lament over oppressive idols – that would seem to me an apt summary of Lambert Zuidervaart’s own commendable summons, in the words of Adorno he quotes in the book, to “let suffering speak” in the hallways of philosophy. Zuidervaart uses the term “spirituality” to refer to what reformational philosophy has traditionally spoken of as “religion”– as in H Evan Runner’s trademark campaigning phrase, “life is religion.” For an account of this distinction partially convergent with Zuidervaart’s, see Rowan Williams, “The spiritual and the religious: is the territory changing?” in Faith in the Public Square (London: Bloomsbury, 2012), 85-96. I find his proposal to situate the activity of the justification of religious belief within a larger account of the “authentication of truth” (250) entirely congenial. I remain unclear why he thinks it is necessary to insist on that point. Why cannot the constitution of “directionality” itself be ontologically grounded? I also agree with the argument made in chapter 6 that such confessions and proclamations are not beyond the reach of philosophical interrogation. Hegel attributes too much to the emancipatory potentials of the modern state. He asserts, for example, that freedom of thought first emerged from the state, not the church. In fact, the first demands for religious freedom (a key instance of freedom of thought) emerged from the dissenting wings of English and Dutch Protestantism in the 16th century. It took the magisterial Reformed and the Roman Catholic churches rather longer to get the point. Nicholas Wolterstoff, Justice: Rights and Wrongs (Princeton: Princeton University Press, 2008). John Witte, The Reformation of Rights (Cambridge: Cambridge University Press, 2007). Zuidervaart doesn’t actually use the term “religious freedom” here, although he does speak (at 243) of the “creative freedom” of religion to critique state power. Is that merely a terminological choice with no substantive import, or is there something in the public rhetoric of “religious freedom” (some of which, in western liberal democracies, is shrill and self-interested) that he wishes to take distance from? Jose Casanova, Public Religions in the Modern World (Chicago: Chicago University Press, 1994); Calhoun et al, Rethinking Secularism. For a popular account of why, see my Talking God: The Legitimacy of Religious Public Reasoning (London: Theos, 2009). These Habermas-inspired notions are spelled out in other writings. See, e.g., Christopher Eberle, Religious Conviction in Liberal Politics (Cambridge: Cambridge University Press, 2002). Another question: are emphatic, proclamatory Tutu-like declarations entirely compatible with Zuidervaart’s stricture that “no…religious community has the right, in a public setting, to proclaim its own critique of other institutions and practices to be the only way” (244)? Jonathan Chaplin is Director of the Kirby Laing Institute for Christian Ethics (KLICE: www.klice.co.uk), and a member of the Cambridge Divinity Faculty. He was Associate Professor of Political Theory at ICS from 1999-2006, holding the ICS’s Dooyeweerd Chair in Social and Political Philosophy from 2004-6. He was Visiting Lecturer in Christian Social and Political Thought at the VU University, Amsterdam from 2007-2011. He is a Senior Fellow of Cardus and formerly served on a board of Citizens for Public Justice. His is author of Herman Dooyeweerd: Christian Philosopher of State and Civil Society (University of Notre Dame 2011). He has also co-edited God and the EU: Faith in the European Project (Routledge 2016), Living Lightly, Living Faithfully: Religions and the Future of Sustainability (Faraday Institute/KLICE 2013), God and Global Order: the Power of Religion in American Foreign Policy (Baylor 2010) and God and Government (SPCK 2009). He is finally working on a book of his own again, entitled Faith in Democracy? Towards a Post-secularist Settlement. This summer, Chaplin will teach a course entitled "Political Theology and the Secular State" at ICS. This is a stellar piece of sifting, appreciation and probing questions. It would be lovely to have Lambert weigh in with some responses. I have no criticisms either of Lambert's chapter or your examination of it but think it criminal not to point out first rate contributions when they are made. Thank you for your contribution to the blog Jonathan. Thank you for this response Jonathan. One strange thing about being party to this symposium is that we are privy to the responses, but not the source. I was able to get an impression of Lambert's article, but I don't know how correct. I am living in Nigeria. Here, citizens are either Christian, Muslim, or practice African Traditional Beliefs. Religion is in the mix here. Cultural life is saturated with religious meaning. That's the reality. My question comes from my experience of this while I live in a struggling nation that turns to religion (spirituality): Is the fretting about religion that Lambert describes a stage of Western development? How does Lambert's comments apply to the developing world, which is still thoroughly religious, at least concerning citizens? Just wanted to let you know that above, in the highlighted "chapter 12" in paragraph two, you'll find a link to this particular source by Zuidervaart to which Chaplin is responding. Unfortunately we can't do that for every response, but for those that have primary sources published elsewhere we have included links both in the content of the responses and in the table of contents to the event itself. Jonathan - you are right that the way Lambert frames the issues in this chapter, and the way I reply, are very western in focus. This framing proceeds from the still dominant 'Westphalian' definitions of both religion (private, and potentially dangerous) and state (public, and emancipatory), but Lambert (as I read him) then wishes to push against those narrow definitions by according genuine public space for religion to play a legitimate and positive role in the democratic system (while under certain proper constraints). So yes, what you call 'fretting' shows up in specific ways in the West. It's a stage' that's going to continue for some time. In fact it's a fierce struggle over the hegemony of a secularist political monism that can't cope with 'alien' forms of religious or other pluralities (even though as Ruthanne's post implies, on the ground there's a lot more practical accommodation of difference than states are comfortable with). Outside the West, where, as you point out, religion is still much more interwoven with cultural and political life and constitutive of personal and group identity, different framings are required which do not assume a Westphalian model as the default starting point. There's now a vast literature exploring religion-state relationships outside the West (eg Calhoun et al eds, Rethinking Secularism). I recall also that Jan Boer, a Reformed missionary, wrote a series of books on just these issues in a Nigerian context. Awesome, Jonathan, thank you for this. I'm going to hunt down those books, especially Jan Boer. There is a spiritual immediacy here that is prior, and then colours thinking. It is like 'interwoven', but what is prior and more important is never forgotten. Amongst Christians, it is a Christian world, but that has its own struggles -it is not an end but rather a state of things. It's like you say, though, the battle is there, even here.